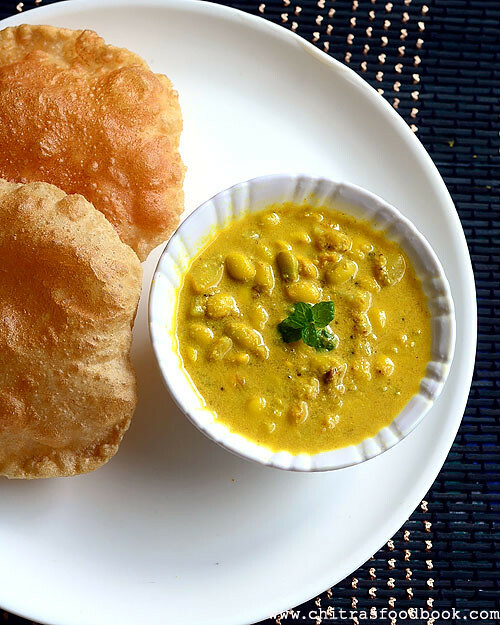 In Karnataka hotels,Poori is usually served with Sagu. Sagu is nothing but a masala gravy/kurma made with freshly ground coconut + spices. 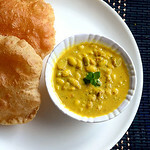 Vegetable sagu is the most popular side dish for poori & chapathi here. But during avarekalu season, it is used instead of mixed vegetables.Last weekend I tried Avarekalu Sagu ( Lilva beans/Field beans in English, Pachai Mochai in Tamil) for the first time following the recipes from my hand written cook book & this blog. It came out really well and tasted yummy with poori. I served the same with dosa for my daughter. I was happy that I made a healthy,protein rich gravy for our breakfast.Now Avarekalu season has almost come to an end. Sorry for this late posting. I hope this recipe would be useful to you all at least for the next season. If you wish to try this masala sagu, just replace avarekalu with potato, cauliflower or mixed vegetables like carrot,beans & peas. The ingredients I have used for grinding masala is the highlight of this recipe more than the vegetables. Do try it and leave your feedback here. 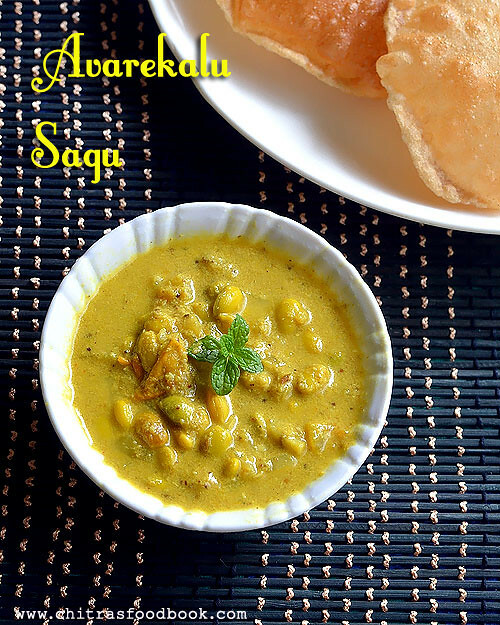 Lets see how to make this yummy Karnataka style Avarekalu sagu/Kurma for Chapathi & poori. Check out my Hitikida bele avarekalu saaru , Avarekalu Huli & Avarekalu Biryani recipes too. Remove the outer covering of avarekalu and wash them.No need to peel its skin.Grind the ingredients given under “ to grind” to a smooth thick paste. Heat oil in a pressure cooker base and temper mustard seeds,curry leaves.Add onions,tomato pieces. Saute until tomato turns mushy.Now add turmeric powder, avarekalu,potato pieces and ground masala.Mix till raw smell goes off. Add the finely chopped mint+coriander leaves, required water and salt.Check for taste and add some red chilli powder if its less spicy. Pressure cook in low flame for 2-3 whistles.Remove the lid and serve hot with poori or chapathi. Add more or less chillies based on your taste.You can replace green chillies with red chilli powder too. Add 1/4 tsp of garam masala powder at the end for more flavor. Adding mint+coriander leaves is optional. 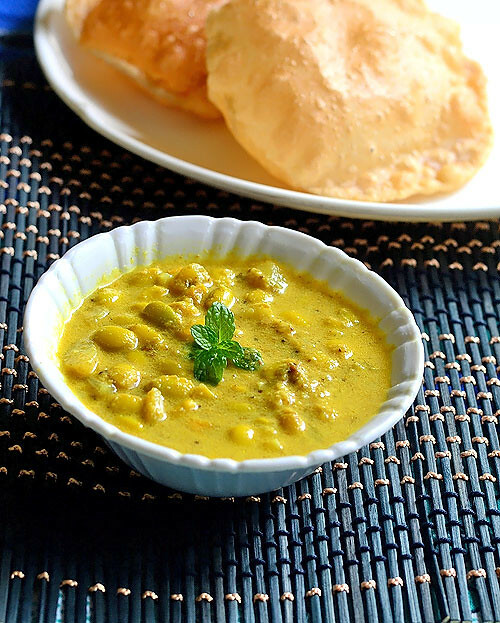 Yummy,flavorful Side dish for Poori & Chapathi,enjoy ! !